A month of Vertigo is light sentence. Most of us who encounter this film end up serving life sentences. Our lives, our thoughts become trapped in the vortex of the strong currents this film produces. 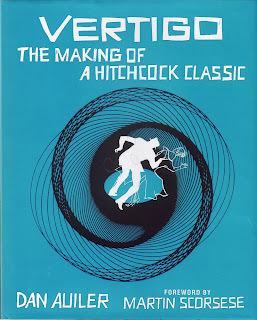 Vertigo's meaning and importance in film have become so varied and vital that choosing one tendril spinning out from one of John Whitney's Lissajous diagrams is challenging - but keeping that line of thought from swirling back into the film's center and tossing you out on some other surprising shore is just about impossible. 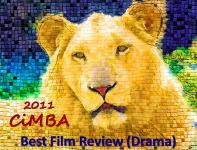 The film has become something I can seldom approach head-on, in a straight line. For example, the original idea for this blog post was to look at Vertigo and the films of Chris Marker. But even on the way to introducing the idea, we encounter John Whitney. John Whitney was the groundbreaking computer animation filmmaker who not only invented computer controlled animation, but hand-machined the devices himself out of surplus Air Force engines. It was on one of these devices that Whitney created the opening spiral designs that Saul Bass used for the title sequence. And now, aiming still at Chris Marker, detoured out of essence to a brief John Whitney nod, we encounter another 20th century giant, Saul Bass. The very look of the last hundred years, let alone the way movies open, have been impacted by the vision and design abilities of Saul Bass. Selecting Saul Bass, John Whitney - these are obvious choices today. In 1957, these guys were not household names even to filmmakers. One of Hitchcock's remarkable abilities was his choice in collaborators. Other posts this month have outlined the other key components of the design team for Vertigo. Bernard Herrmann, Edith Head, Samuel Taylor - again, hindsight provokes us to ask how the film could fail. and only for one place." What then is the time and place for Vertigo? This is a profound question in the structure of the film. It is an even more profound question for us, the film's fans. What is the time and place of this film in our lives? For me, it has been the gateway, the worm hole, the central vortex around which all of Hitchcock's films and subsequently my own psychic life turn. Use Vertigo as a starting point and then lose yourself as a wanderer. My latest encounter on the Vertigo trail is the three-part video essay curated here at the Museum of Moving Image. This is accessible but heady stuff. There are other "better" films even in the Hitchcock canon, but Vertigo is perhaps the most profound pop film. Everyone chooses which films lie closest to their own heart, their own story. Vertigo is that film for me. Dan Auiler is the best-selling author of Vertigo: The Making of a Hitchcock Classic (St. Martin's Press 1998, Kindle 2011) and Hitchcock's Notebooks (HarperCollins 1999). In addition to his writing, he has taught for more than 20 years in the Los Angeles area. Dan is considered one of the foremost authorities on Alfred Hitchcock and has made appearances on CNN and other major networks as an expert on Hitchcock, Billy Wilder and general film history. It was after reading Dan's painstakingly researched and thoroughly insightful book on Vertigo that The Lady Eve was inspired to undertake A Month of VERTIGO. Dan's blog is Vertigo Falls. Very thought-provoking. It is great to read an article from someone who quite literally inspired theladyeve to start this event! I enjoyed the detour with John Whitney and Saul Bass. Very interesting facts about their collaboration with Mr. Hitchcock. 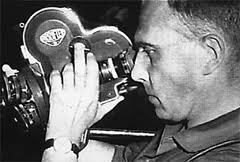 I've seen La Jetee and am familiar with Chris Marker. Without a doubt, he certainly was hugely inspired by Hitchcock and Vertigo. I still have to see San Soleil, however. Great post. One excellent post for the closing days of the event. Take Care! Interesting analysis. I don't really like Chris Marker's work, but at least you put it in some perspective. An interesting look at Vertigo. I must admit that this film isn't one of my favorites of Hitch's work but I can appreciate it. Thanks for reminding us of the locations that serve such a large role in H's films. Right off the bat I think of Mandalay, the sharp curves and hills in To Catch A Thief then there's the scenery that envelopes us in Psycho and The Birds. Psycho having the most recognizable house in films. Dan, a most unexpected approach to "Vertigo," which has surely been analyzed from every imaginable angle, and not only here at REEL LIFE. Found your introduction of Chris Marker for the time and memory element of the film's themes, and John Whitney and Saul Bass for its visual design very thought-provoking. Your comment that Whitney built his first computer animation devices from Air Force engine parts had me thinking of the spinning, spiraling fan blades of a jet engine when viewed head-on! "There are other 'better' films even in the Hitchcock canon, but Vertigo is perhaps the most profound pop film." A concise statement of the film's appeal--flaws and all, it's a hypnotic and enduring presence in the memory of Hitchcock devotees. Mr. Auiler, your statement that when it comes to contemplating the meaning and importance of "Vertigo" many of us are "serving a life sentence" is well put. I can't even remember when it was that I first saw this masterpiece (I know it was many decades ago) but it has from the beginning become a part of my life that continues to grow and open up to new insights. The film's elusive nature, which far from revealing an open-and-shut case in linear plot development, is probably what allows for new viewpoints and pathways to emerge. Will we ever fully "know" this film is similar to the question, will we ever fully "know" ourselves - the knowledge that we do aquire is something that evolves over time. It IS like entering a wormhole that leads to multiple dimensions. The Chris Marker clip from the Museum of Moving Image is well worth the time it takes to explore some of the film's inner workings - I reccomend it to everyone who is participating in "A Month of VERTIGO" (you may not like it, but you may also find it quite rewarding). Obviously "Vertigo" inspires speculation and flights-of-fancy - in that sense it's almost like a Rorschach where the viewer is projecting his psychic world onto the image. "Vertigo" is constructed more like poetry than prose and so it not only invites such Baroque intrepretation but, if the viewer is to be true to it's artistic depth, it almost demands it. I loved Marker's remark regarding the mysterious Gavin Elster: "and so his plan begins to make sense, not as a murder plot, but as an enchantment". Also, his characterization of "a San Francisco free from linear time that returns to a time of myth and primal figures". The theme of "love, abandonment and fall" also resonates on a deep psychological and philosophical level. I'm grateful for your contribution and also for exposing me to Chris Marker's through-the-looking-glass view of "Vertigo". It's an endless source of fascination to me to see what different people are able to glean from this enigmatic classic. A poetic meandering around the whirlpool's edge, Mr. Auiler. Nicely done. I genuinely enjoyed the stroll. A friend of mine at work today told me he's NEVER seen a Hitchcock film and asked me where to start. I suspect I won't bring him my DVD of VERTIGO, but which Hitch film would you (and Lady Eve's other fine readers) recommend as a starting point for a very modern young man who is an accomplished artist in his own right? It is very nice to read from the author who inspired this amazing month. I have explored some of the work mentioned through a friend, Thift_Store_Junkie at the Classic Film Union. It has been a pleasure. thanx for the analysis and perspective...and for keeping it simple and straightforward...you are so right in noting the hyper-analysis of VERTIGO and other films...I think a movie goer should be able to enjoy the themes/textures/montages/set-pieces of VERTIGO without knowing what HITCH had for lunch that day!! Dan - I can only agree with what everyone else here has stated, the importance of the San Francisco location and the contribution of the great Saul Bass. Thanks very much for this contribution. @ Kay - Notorious, Rear Window, Psycho, and The 39 Steps are good primers for someone just getting into Hitchcock. Thanks, John, I'm a HUGE fan of 39 Steps and Notorious and Rear Window (and own them), but I think Psycho is Hitch 201 for this person. Very kind of you to advise! Kay - re your modern young friend: How about "Strangers On A Train" - no Hitchcock blonde, but Bruno is great fun . . . "criss-cross" and all that. I like the book you mention at the end. It was a very good read. Dan - Your opening paragraph is a painful reminder to me of the problems I've had finishing my own post - the near impossibility of maintaining focus on the "tendril" I chose. As you know, your book on Vertigo had much to do with inspiring this month-long (plus) tribute. You make a point in the book's introduction that this post brought to mind: "Vertigo is not the perfect, pure cinema of Rear Window. Yet who is haunted, dogged, pursued by Rear Window?" No, Vertigo may have its imperfections, but it has a profound power and eternal quality possessed by very few films. My deep and sincere thanks for contributing a knock-out post to "A Month of VERTIGO." Thank you very much for sharing your very interesting "VERTIGO" contribution with all of us "VERTIGO" fans. I'm not very familiar with Chris Marker's work. So thank you for introducing him to me. I also, want to read your book on Vertigo. I'm a big fan of your book. Good call, Moto Boy...Strangers is one of my faves and it's very "accessible". Perfecto! Thanks for your suggestion!